This week I’ve chosen quite and old photo, from Christmas Eve 2007 in fact. I guess it shows where my priorities lie, of all the things I could be doing on Christmas eve, I’m out with my camera shooting trains during the golden hour! This shot shows Belgian NMBS/SNCB Class 11 electric locomotive number 1185 charging through the village of Duffel in Belgium with an international express train from Amsterdam to Brussels. Locally these trains are known as ‘Amsterdammers’. The entire train used to have the lovely yellow and burgundy livery you see on this locomotive, but a few years ago the Dutch railway company (NS) started to use a new red, white and pink livery on their international carriages. 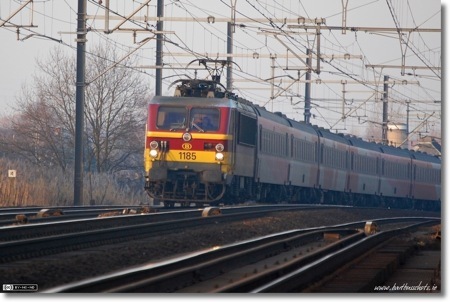 The NMBS Class 11s are now also becoming a thing of the past, as more and more Amsterdammers are now being worked by red and white NS locomotives from Trax. Call me nostalgic, but I’ll be sad to see the days when Class 11s don’t come racing through Duffel on their way to and from Amsterdam. I really like the lighting here in the “golden hour”.